Environment Canada has issued a Hurricane Watch and Tropical Storm Warning for southwestern Nova Scotia. The previous Tropical Storm Watch remains in effect for the rest of Nova Scotia and southwestern New Brunswick. 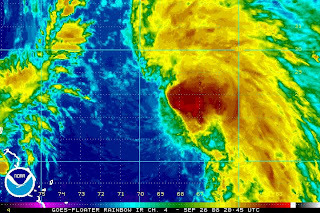 Hurricane Kyle's forward speed has increased to 23 mph toward the north. At 5 pm, the storm was centered about 485 miles south of Nantucket. Some additional strengthening is possible in the next 24 hours, followed by a little weakening just before landfall. The forecast track shows that landfall is likely in extreme eastern Maine or southern New Brunswick. 2 pm Update: Tropical Storm Kyle's forward motion has now increased to 20 mph, and a further increase is expected the rest of today. Kyle is moving north from a position about 550 miles south of Nantucket. Maximum winds remain at 70 mph. Tropical Storm Kyle strengthened last night to maximum winds of 70 mph. A Hurricane Watch has been issued for the eastern Maine coast from Stonington to Eastport. A Tropical Storm watch has been issued from Stonington southward to Cape Elizabeth, including the Portland area. Hurricane Local Statements have been issued by National Weather Service Offices in Caribou, Portland, and Boston. A Tropical Storm Watch has also been issued for portions of the Canadian Maritimes. Kyle has been zigzagging between northwest and north; its current track on average is toward the north northwest at 15 mph. A gradual turn to a more northerly direction is expected, which will bring the storm to a landfall near the Maine/New Brunswick border late Sunday. Some additional strengthening is likely, with weakening again before landfall. 5 pm Update: Aircraft reconnaissance indicates that Tropical Storm Kyle's maximum winds remain at 60 mph, although the storm is somewhat disorganized from the effects of wind shear (upper level westerly winds). The track continues to be to the west northwest, but a gradual turn to the north and north northeast is expected. The forecast path has been shifted a little to the east, increasing the chances of a landfall on the southwestern coast of Nova Scotia. 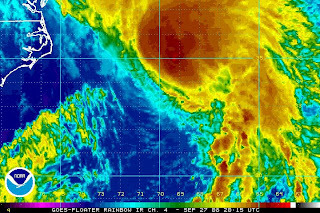 Tropical Storm Kyle strengthened overnight; maximum winds are now 60 mph. The storm is moving north northwest from a position about 475 miles south southwest of Bermuda. Some additional strengthening is likely, with Kyle becoming a hurricane by Saturday night. The forecast track continues to take the storm center well to the west of Bermuda, but westerly wind shear is forcing the strongest winds to the east side of the storm. 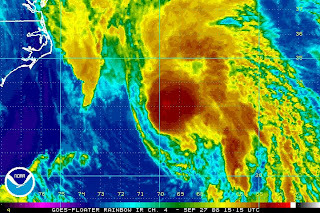 This has prompted a Tropical Storm Warning to be issued for Bermuda. As the storm continues on its northerly course, it is expected to make landfall late in the weekend somewhere from eastern New England through New Brunswick or Nova Scotia. Hurricane force wind gusts are possible as the storm reaches the Canadian Maritimes. 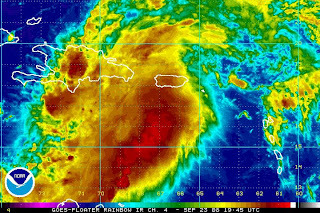 The stormy area which brought all the heavy rain to Puerto Rico and Hispaniola has organized into Tropical Storm Kyle. Maximum winds reported from aircraft reconnaissance are 45 mph. 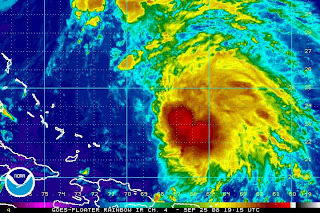 The storm is located about 650 miles south southwest of Bermuda, heading north at 8 mph. The expected track takes the storm near Bermuda and eventually toward the eastern New England or Canadian Maritime coast. The public in southeastern Canada has been advised to monitor future developments. Some strengthening is forecast during the next couple of days, and two major models predict it to reach hurricane force. A low pressure area now centered near the eastern Dominican Republic has brought major flooding to parts of Puerto Rico over the last several days. At least 4 deaths have been blamed on the storm, which has produced as much as 20 inches of rain in some southern parts of the island. The stormy area has been investigated several times, including this afternoon, by aircraft reconnaissance. Although the potential for tropical cyclone development is rated high (greater than 50%), so far there is no sign of a closed circulation. A tropical depression could develop at any time, however. If it develops further, it will become Tropical Storm Kyle. The forecast models move the potential storm toward the northwest, possibly threatening the U.S. Atlantic coast. 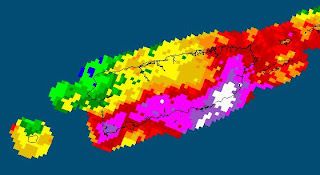 Images: Precipitation total through 8 am this morning from NWS/NOAA, infrared satellite view from SSD/NOAA.